Disclosure: This is a sponsored post for AVEENO®. I'm a 2014 AVEENO® Ambassador. All opinions are 100% my own. I received a 12 oz bottle of AVEENO® Daily Moisturizing Lotion and a $100 Visa gift card for participating in the #AveenoDailyChallenge. Come with me on my three week personal journey, as I commit to activities that will help me de-stress, meditate, reflect, and take time for myself. I'll be using AVEENO® Daily Moisturizing Lotion everyday, along the way. Challenge #2 - Meditate In The Morning! Wake Up Differently! How do you wake up each morning? How do you start your day? I usually jump out of bed, shower, put my clothes on, eat a little something, and then head out the door. I've decided to slow things down a bit and wake up differently. I'm going to wake up a little earlier and just be still for a few minutes (silence). I'm going to use that time, to gather my thoughts for the day (meditate & reflect). 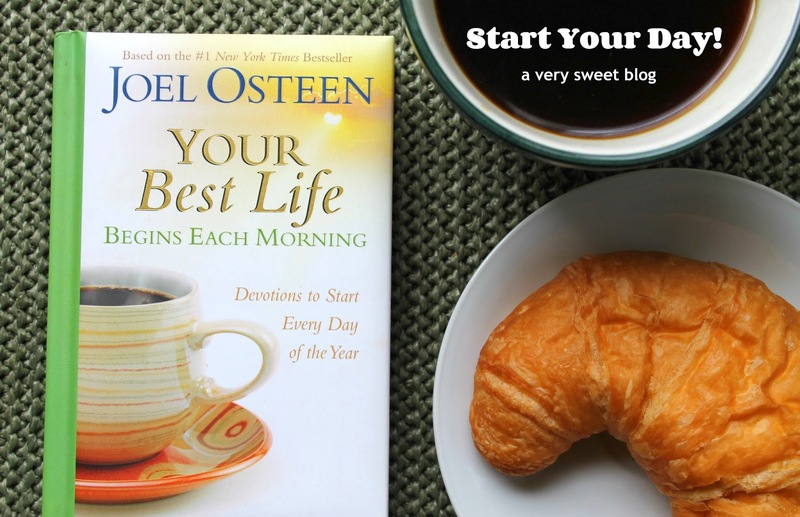 I purchased a book by Joel Osteen, called "Your Best Life Begins Each Morning" It has devotions for every day of the year. The devotions only take a couple of minutes to read and they're very positive. I think it's good to start the day positive, because throughout the day we are bombarded with negativity. HaHaHa When I was at the bookstore, I found a number of little devotional books like this. What a great way to begin each day! Now I need one for afternoon & night. LOL Happy Tuesday! 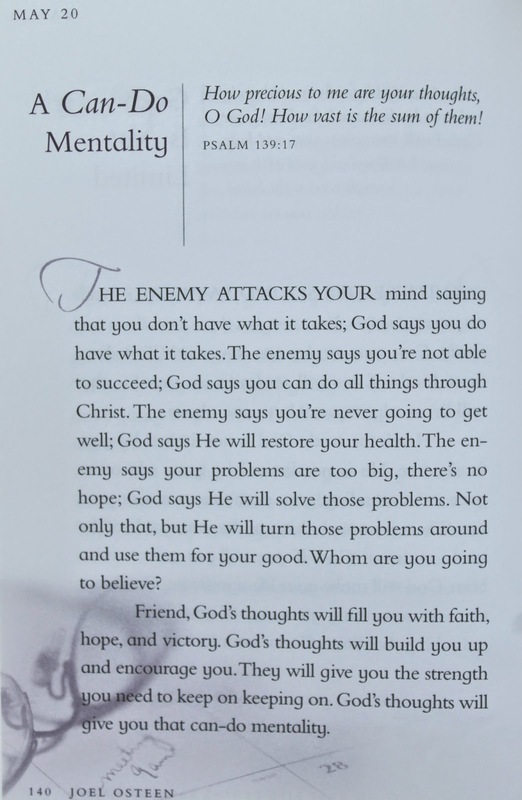 Great way to start your day and I love Joel Osteen's books! Great post Kim. Food for thought. I'm sick AGAIN so when I'm better, life changes are needed so I'm not so run down and catch every bug going! Kim I have to say I really respect the way you do sponsored/gift posts. You have such integrity! On the next point, what a great way to start the day. I swear these little readings would come in really handy for me when confronting the crowded trams on the way to work. That's great. I always like to stretch in the morning, but lately I can't seem to do that because I've been waking up late. But yeah, gotta wake up earlier to do a morning ritual that's going to make the whole day better. Such a great way to wake up in the morning! Every morning is like a mad rush to me to get myself and a little one out the door I never have enough time to reflect, Kim. However this sounds awesome and I am sure it makes a huge, positive difference. I need to wake up earlier so I won't be in a hurry (but that's so hard). I love waking up slow like that! I like sleep too much on week days, but I try to wake up slow on weekends. I hope this helps you stay relaxed. I felt more relaxed and calmer after reading this post. Now interested in the book you mentioned. Very nice and inspiring Kim. I usually meditate in the morning for a few minutes. I will check this Book. I recommend to you too the book Shift Happens by Robert Holden. Robert Holden also wrote the book Love-a-bility. It is also very positive and inspiring. Have a wonderful day! such a great affirmation, kim! having a good start really sets the tone for the day. well at least it did for me. when i rushed i was just off my element, but on days when i had time to eat and read the newspaper and head out the door by giving my dog a prolonged hug and good bye and carpooling with my husband without asking him 20 different questions about "did you shut the stove off, did you lock the door, etc." and arriving at the office with a sane mine made my day flow that much easier! I usually hear my alarm clock and sleep about 15-20min more. Then I know I have to get out of the bed otherwise I'll be late (I'm always late) and this stresses me. After that I go for breakfast, shower, etc. I have always wanted to get up at lest 1 morning on time and not be in a hurry. I like the way you put your life in order. Seems that the Aveene challenge is a good one! Hope we could follow each other. I'm a blogger from Tokyo. Thanks for this post, Kim. I'm one of those too that just jump out of the bed and start the day in a rush without taking the time to find that peaceful moment first. I'll see if I can start having some quiet time first before starting off the day. I'm sure it would make a lot of difference, esp. my state of mind, right? Hope ur having a fab day, my friend. I love the idea of taking a little time out for yourself each morning to reflect and meditate Kim. It could have a really positive effect that will last for the rest of the day. My mornings are typically like yours. I am in a constant rush until I am out the door. I would love to wake up a few minutes earlier to mediate/reflect on my day. Now if only I can force myself to wake up earlier than 5 am. For close to two years now, I've been getting up early every morning to practise yoga and meditate. It's the best thing I could have done for myself - I hope this will have a positive impact on you, too, Kim! Hey THIS and THIS brands are looking for famous bloggers like you, discover them! I do need to be better about doing my devotions in the morning...or sometime during the day. i used to do the affirmations a while ago and then life got a bit crazy and stopped... i will follow your advice and start doing them again... thanks! Sounds like the perfect morning, Kim! I have JUST started meditating myself, only about five minutes a day after yoga in the morning, but I really think it helps! I'm all about getting out the door in the morning so I'm trying to learn from this and try to start slower, enjoy the morning and be grateful. It's something I take for granted for sure. 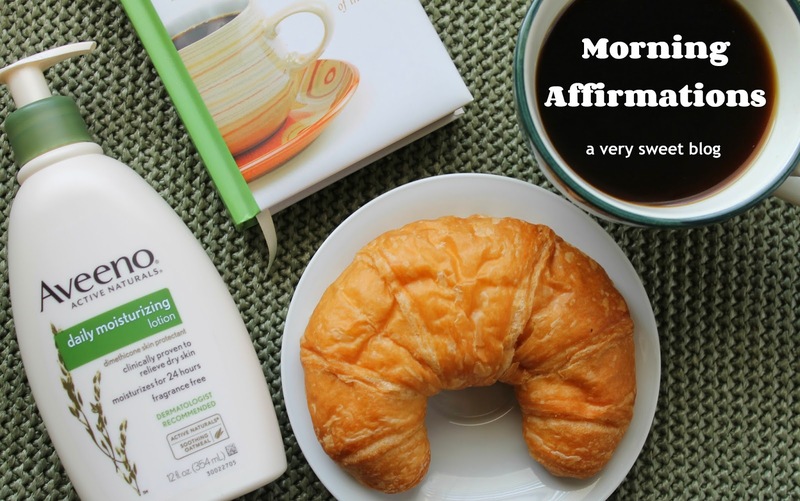 Affirmations and meditations sound so smart and definitely relaxing. These sound great. I must look up this book. I heart Joel. this is the best way to start your day! love your posts! I need to start doing something like this… my days are just.. blahh. my mornings are super rushed. while i do have some time at the end of the night, i still feel "busy"!! there is something serene about quiet mornings. Starting your day off with positive thoughts is brilliant. It's something I need to do, and something everyone needs to do! Thank you so much for sharing these affirmations, and reminding me to do this everyday. I bet you feel so relaxed every morning! What a great idea! OK I need this book, I have been going through a bit of a rough time this is perfect. Thanks for posting. I've heard from others that reading devotions, a religious book, or something else that helps you reflect is the BEST way to start a good day! Love this! 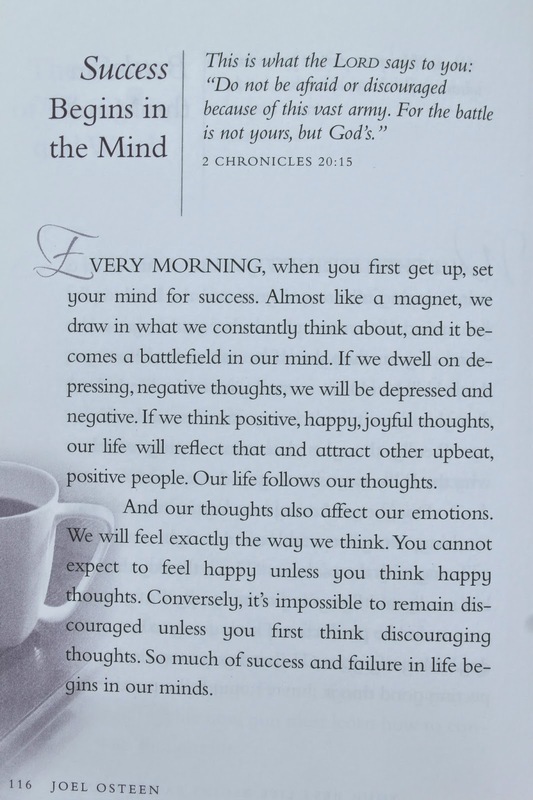 Definitely a good idea to start the day with a positive attitude and happy thoughts which set the tone for the day. I've always tried to be around upbeat, positive people which helps the day to go well! The book sounds interesting and I'm a fan of fragrance free body lotion but haven't tried this brand yet! Soak It Up! What's Your Soak-In-The-Tub Regimen?